The 2018 NFC Championship blowout was one of the most memorable Philadelphia Eagles games to date. The Eagles unstoppable offense picked apart a Minnesota Vikings defense while the Eagles defense demolished a high powered Vikings offense. The Vikings defensive line held weapons like Everson Griffen, Linval Joseph, and Danielle Hunter, but they were no match for Nick Foles’s and the Eagles lethal run-pass option offense. Over the course of the regular season, Vikings opponents were 51/202 on 3rd downs. On Sunday, January 21, 2018, the Eagles converted 10 of their 14 3rd down attempts. Nick Foles went a sensational 26-33 for 346 yards and 3 touchdowns, while the defense added 3 turnovers. It was a complete team effort for a pure NFC Championship blowout. Unfortunately, Minnesota Vikings fans have still not been able to move on or accept that the Eagles were simply a better and more complete team. According to Mike McFeely of the Fargo Forum, several Vikings fans complained to the NFL of their treatment during the NFC Championship game, and are being listened to. Apparently, the NFL has launched an investigation into the Eagles fan conduct during the NFC Championship blowout. According to the article, the investigation has been going on for weeks and there will be an announcement regarding future changes. Vikings fans are reportedly being interviewed by the NFL regarding their experience at the NFC Championship game. However, let’s take a look at this from an Eagles fan’s perspective. If you Eagles fans remember correctly, the Birds actually played more games this season than just the one against the Vikings. In fact, prior to the NFC Championship blowout, the Eagles played 17 other games. Of those 17, 9 of them were played at Lincoln Financial Field in Philadelphia. Giants, Cardinals, Redskins, 49ers, Broncos, Bears, Raiders, Cowboys, and Falcons fans were all present for their respective match-ups. Somehow, Vikings fans are the only ones who seemed to have problems. Why? Even though news outlets had been issuing warnings about Eagles fans past behavior, (no one ever lets us forget about the snowballs…sorry Santa!) Vikings fans disregarded and poked the bear. It was not playful, it was the ultimate form of disrespect to a city that was already being disrespected enough. First Vikings fans took to social media and news outlets proclaiming they would take over the Linc on NFC Championship Sunday. Travel agencies put together packages that included airfare and transportation to the game, so the Linc would flood with purple and dominantly consist of Vikings fans. That was strike one. Next, the Vikings fans took the opportunity to explore the beautiful city of Philadelphia. They did what everyone must do at some point in their time in Philly, and ran up the Art Museum steps like Rocky. However, once they got to the top, they stood in a pack, clapped their hands above their heads chanting “skol!” Strike two. Their last action was the breaking point for Eagles fans everywhere. 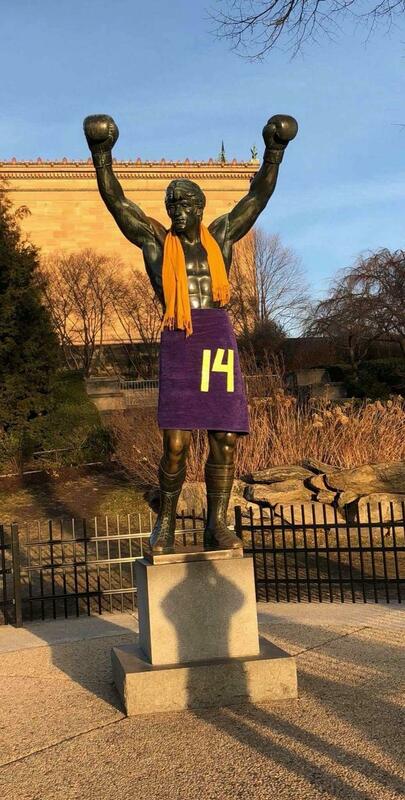 They dressed up our precious Rocky statue in that awful purple and gold. Strike three. Why Did This Sting So Badly? Rocky, even though a fictional movie character, embodies the grit and determination of Philadelphia. He is the original Philadelphia underdog. This was no longer just a football game. This became deeply personal. Not only did the Vikings fans claim to take over our city, run up our steps doing their chant, and dress up Rocky in their colors, but they posted photos and videos all over social media, all before 11:00 AM. Gametime wasn’t until 6:40. This meant that every single Eagles fan, whether they were going into the game or just going to tailgate, saw the evidence. The Eagles were the first number one seed underdog in the Divisional Round at home since 1970. Our players, fanbase, and city felt disrespected. Even after surviving 3 enzone shots from Matt Ryan to Julio Jones the Eagles were still underdogs to a team that won their divisional game by a miracle mental mistake by a rookie. The players were hungry, the fanbase was hungry, and according to Jason Kelce, hungry dogs run faster, which is exactly what the Eagles did during that NFC Championship blowout. We already felt slighted and disrespected. Those photos and videos crossed the line. The Vikings landed the first punch. They got us. However, they couldn’t take the backlash or the “Foles” chants. Eagles fans responded by booing anyone in purple that walked by, but all in good fun. I was at the tailgate and there were plenty of folks in Vikings jerseys welcomed to share food and drinks and celebrate a happy and successful NFL season. The Vikings had an amazing season. They were a top contender all season with an explosive offense and dominant defense. They deserved to be in that game as much as the Eagles did. Some reports have shown, however, that Vikings fans are claiming their team’s players did not perform well during the NFC Championship game due to threats made by Eagles fans. Instead of being able to take the punch of the loss, and keep moving forward, the complaining began. The reality of the situation? The better team won. Nick Foles played one of the best games of his career and every man did their job on defense. Vikings fans are whining as if their team lost to a group of scrubs; that same group went on to beat the best player in NFL history. This was no team of scrubs. This was a team hungry to win. If the Vikings would have won would Eagles fans have suggested the outcome might have been different without all of the injuries to the team? Probably, but that is every fan base’s response. But that is what made this Super Bowl ride so special. The adversity this team overcame is what made the Super Bowl win even sweeter. It means that no analyst, coach, player, or fan base can say the Eagles did not prove they were the best team in the NFL. It is ridiculous for the NFL to conduct an investigation into fan conduct before the game, all because some Vikings fans had their feelings hurt. Did some ridiculous and overly intoxicated fans cross a line? Yes. Does this happen in every stadium? Yes. I don’t know what will come of this investigation, but I can only hope the NFL looks at all of the facts. Just to be clear, I speak for the majority of Eagles fans when I say I do not agree with throwing full cans of beer, or the signs saying awful things about Millie. Those things were awful, which is why Eagles fans tried to make amends by donating to the Mike Zimmer Foundation. To any Vikings fan whose feelings were hurt by being booed or screamed at as they walked into the stadium, I’m sorry. But, we’re from Philly. No one likes us and we don’t care. We hosted 9 other opponents fans before yours and none of them seemed to have any sort of problem. Next time keep the purple and gold for yourselves, and off of our Rocky statue. That’s how winning is done. Tell us what you think @PSN_Philly. Featured Imagine: (Aaron Goodyear) Via Flickr. Well spoken. Let them review all of the facts. I saw these events unfolding on national tv before the game. Those Viking fans should be grateful they only had their feelings hurt. Some fans in every city will get a little out of control, not just in Philly. I’m just so glad they had the long ride home to think about what they did to Rocky. That was exactly what I was thinking! We played 9 other opponents at home and none of them had any trouble. Even Cowboys fans! They didn’t cross the line and disrespect our Rocky statue. They came to our city, cocky that they were going to take over and then got upset when their team got blown out. I’m sure this complaining wouldn’t have happened had the Vikings won. Bottom line, you mess with the bull, you get the horns. They would have defended their city too, don’t cha know. And yeah, a few people were a bit much, but that will happen no matter what when you get tens of thousand passion people together and add alcohol.